A simple premise, and very adaptable. Plus it gives us a nice opportunity to get up and get moving! Label one area (e.g. one side of the classroom) with "Yes" and another area with "No"
Give each student a number. Ask yes/no questions about the numbers. 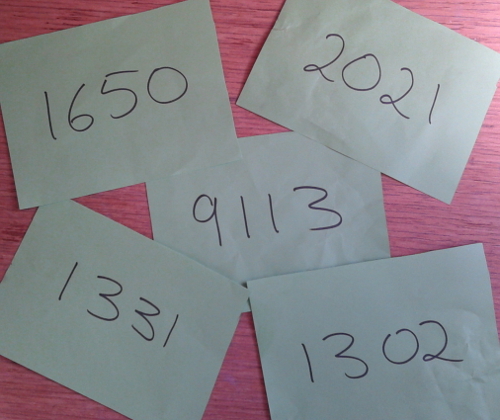 Students have to go to the correct area, holding their number where you can see it to check. For example, today I played this with my Peer Numeracy roll call (which was extra good because it was a small group and the year 10 mentors helped check and helped the students who struggled). First I did numbers in the hundreds, then in the thousands. Are you more than 50? Are you more than 400? Look at your tens digit. Is your tens digit more than 3? Look at your hundreds digit. Is your hundreds digit odd? Add up your digits. This is your digit sum. Is your digit sum even? And so on. At the end of each set of questions, I got them to line up in ascending order and collected the numbers and gave out the new numbers. Are you a multiple of 3? Is 4 a factor of you? Are you a square number? Are you a triangular number? Are you in the Fibonacci sequence? If you add 3 to yourself, are you a multiple of 5? Use algebraic terms and ask about "are you a like term to ...?" or "is .... a factor of you?"